Following the recent replacement of the statistics office chief, the ongoing dispute concerning the Moon Jae-in administration’s income-led growth initiative has now expanded into an argument on the credibility of key economic indicators here. While the presidential office and the ruling party held the statistics office liable for a sampling flaw, the opposition camp claimed that the administration was deceiptfully trying to cover up its thwarted economic strategies. “Statistics cannot be generated in assumption of a specific context,” Statistics Korea Commissioner Kang Shin-wook told reporters Tuesday after his inauguration, underlining the political neutrality of the office. The new chief had been appointed earlier to replace predecessor Hwang Soo-kyeong, whose sudden dismissal drew suspicions that Cheong Wa Dae was exerting pressure on the statistics office for “tailored” economic indexes. Further amplifying the conspiracy theory was the discontented remark by the former statistics office head. “I was not much of an obedient type, I suppose,” Hwang said in a press interview, shortly after her farewell ceremony. Statistics Korea‘s quarterly report on household income earlier showed that the average wage of the lower 20 percent income bracket dipped further, rekindling doubts over Moon’s income-led economic growth agenda. The office issued an additional set of press releases, underlining the differences in the sampling of households, but combined with the nation’s struggling employment indexes, these income figures delivered a heavy blow to Cheong Wa Dae’s policy legitimacy and the president’s approval rating. In the second week of August, President Moon’s rating hit 58.1 percent, the lowest since he took office in July last year, while that of the ruling Democratic Party of Korea came down to 40.6 percent, according to local pollster Realmeter. Though partly attributable to an online opinion-rigging scandal involving a close presidential aide, the downtrend was mostly due to a series of pessimistic economic indicators, according to observers. 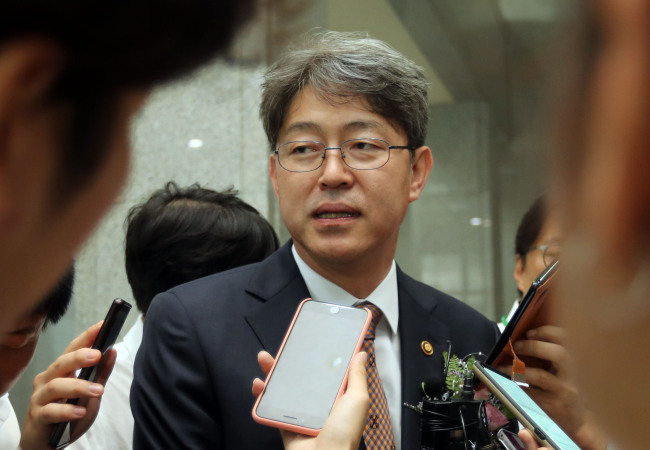 “Appointing (the previous commissioner last year), Cheong Wa Dae claimed that she was the right person to support the income-led policy as a reform-minded economist,” said Rep. Joo Ho-young of the main opposition Liberty Korea Party. Household survey data were slated to be abolished starting this year, due to a decreasing response rate, especially from high-income households. But the incumbent government revived the survey system late last year, in the hope that results might show a rebound in household income and thereby add fuel to the income-led growth agenda. In the process, the number of sample households was raised back to 8,000 from 5,500 to improve the accuracy of the results and to better reflect the demographic changes of the nation. The consequent increase of single households and elderly families -- which tend to account for low-income units -- was a key reason for the sudden income decrease shown in the data, according to the presidential office and the ruling party. “Statistics are at all times subject to various interpretations, and the demographic change in the sampling households may possibly have affected the outcome (of the survey),” said Woo Seok-jin, a professor of economics at Myongji University.